Have you ever read Dune? Set 20,000 years in the future, it tells of a universe controlled by a hodgepodge of corporate and feudal interests. There’s an emperor balanced against a council of noble families. Then there are powerful interests that control trade, interstellar travel and religious mysticism. The interplay between these factions makes for a damn good story, but it also foreshadows a real-life future of corporate feudalism. Here in the early 21st century, we are witnessing the end of the nation state and the rise of corporations that control the world’s resources like feudal lords. Feudalism developed in the Middle Ages when communication and transportation were both scarce and unreliable. Kings had little control over the day-to-day affairs of the kingdoms, and most of the power was held by the lords and barons. Borders as we know them did not exist. Instead there was property and allegiances. For example, the Duke of Normandy, William the Conqueror, was a vassal of the King of France. Then he conquered England and became a king in his own right. But he still owed allegiance to the French crown, as did all of the kings of England for generations after. Today we think of France and England as being two separate countries, separated by the English Channel. But that concept is fairly modern. For a good chunk of history, things were a lot more complicated. Advances in technology allowed nation states to form. After the bloody battles of the Thirty Years War and the Peace of Westphalia, borders became much more rigid. With printing presses and railroads, kings and presidents could control large homogenized swaths of land. Printing allowed for a common language and religion. Improved travel allowed for strong political and military control across the land. And as time progressed, this idea spread across the face of the earth. European nation states divvied up the world into colonies. Then those colonies became nation states of their own. To this day, people still think in terms of nations and borders, but the times are changing. The same technological advances that built the nation state are now leading its demise. The telephone allows companies to have employees and suppliers anywhere in the world. Container shipping allows us to produce goods in the cheapest places possible. Air travel, internet and television allow people across the earth to have the same cultural backgrounds, the same points of reference. This means that a company can incorporate in Delaware, design goods in California, produce them in China, ship them on a Norwegian ship registered in Liberia, and sell them all over the world. Tech support can be based out of India, and the executives making the money can keep their money in Switzerland and the Cayman Islands. This kind of thing happens everyday, and the ramifications are just beginning to be felt. Ultimately, this will lead to the return of feudalism. In the United States, health care is provided by your employer, not by the federal government. And since Obamacare, this concept has become enshrined in law. I think that, as the power of multinational corporations grows, you will find a weakening of nation states. Citizens will owe their health and safety to their employers and their landlords than to a centralized government. There will still be government, of course, but its role will diminish. Corporate oligarchy will be the new norm, and I’m not sure if we can stop it. Instead we just need to make sure that this new system functions as freely and democratically as possible. We may not be able to stop the rise of feudalism, but we can try to make sure our future is not as bloody and dramatic as the world of Dune. What do you think? Do you think we’re on the road to corporate feudalism. And if so, what should we do about it? I thot I had coined the term “corporate feudalism” and have been formulating an essay to post on blog sites I frequent. Decided to Google the phrase and low and behold I find many references, including your. I’m an evil republican, but since the crash of the real estate bubble and the massive bailouts of those who caused it, I have found myself disappointed at my fellow evil republicans, as well as those so called free market capitalists who justify everything businesses do and tell you “well, if you dont like it, go someplace else”. We are losing our rights and our freedoms day after day. Both dems and repubs are bot and paid for by businesses and unions and other special interests. The net result is that all of us are being herded into the slave quarters of those who have become rich enough, powerful enough that they no longer care to even try to hide their intent. Thanks for your essay here. Keep up the good fight. Perhaps you are not, after all, an evil Republican? I myself am a leftist Canadian libertarian. The apparent erosion of civil rights, or the rights of citizens: that’s a concern all across the political spectrum. What else might we agree about, that we’re not aware of? If there are to be powerful/transnational corporations, then surely there must be powerful government(s) that protect the people. It seems to me, this won’t happen (for Americans) while money=speech. I had a political science prof once, who taught me: governments do the things that the people want, that the private sector can’t or won’t do. However, the people seem not to be in agreement about anything. Hmm… who benefits by stirring up the argument? Yes, I feel that our government has transformed into a semi-feudal state. Let’s face it, economies run nations and in our nation the top 2% of wealth is greater than the other 98%. This 2% are the leaders of our Big Corporations and Real Estate holders. We are also ruled by Big Government which is greatly influenced by the Lobbyists of the Big Corporations. We are completely at the mercy of these business holders who have the control to redistribute our jobs globally and invest in other economies. Many of our leaders started in Big Business or are a party to both simultaneously. The only difference in the feudalism of today versus the feudalism of old is that we have more freedom to move from “lord” to “lord”. We live more freely than at any other time in history, however, do not be fooled….there is a BIG Thumb over each of us! I am a reporter on the economics magazine for a new news station based in Tel Aviv-Jaffa called i24news. 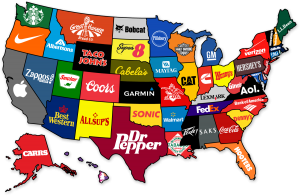 We were hoping to use your amazing (corporate) map of the US for a short segment where we look at some of the important issues of the moment (era, in this case). I am available at this email anytime. William Gibson extrapolated our world into a near-future with Corporate Feudalism – Neuromancer, Count Zero, Mona Lisa Overdrive. I think you’d like them. Hello Steve, thank you for article. If USA is state of “Corporate” Feudalism, who King ? In Feudal system always exists кing, who is this overlord? There are a candidate? Governments will be usurped by corporations. Eventually “society” will become too chaotic and corporations will (this is done in the third world for decades already) operate within gated communities. You will require a passport to enter them, and be required to leave at the end of your shift. For the elites they will reside within other gated communities that operated like a nation unto themselves providing the executive with all the services of any nation, all within a nation and yet exempt from that nation’s oversight because the executives comprise the government itself. While this seems inevitable it is possible to stop it, either because corporations will be unable to adjust to a resource based economy in the future and will therefore lack the stability required to dominate every moment of every worker’s life, or, the environmental and human rights movement will successfully gain control of government, establish democracy, and nationalize corporations. The 21st century is certainly going to be the most interesting, most dramatic, and most violent century yet. Nationhood requires economic sovereignty, the ability to control its medium of exchange. No country that has a privately controlled central bank is a nation, it’s just a political veneer on a feudal system of debt-enslavement, on its way to becoming a fascist police state. Debt-based money is the economic foundation of totalitarianism. Without being overly dramatic, this is the key to human liberation. the full title should be: THE BRAVE NEW WORLD ORDER OF CORPORATE FEUDALISM, INC.
but don’t forget the “butterfly effect”…infinity doesn’t stop. Previous story Are You Going to Scarborough Faire?